If the website with Utilu Silent Setup for Mozilla Firefox is visited by someone with a browser like Internet Explorer, the visitor will see a message telling him or her to run the program if the visitor wants to be able to use all functionality of the website. 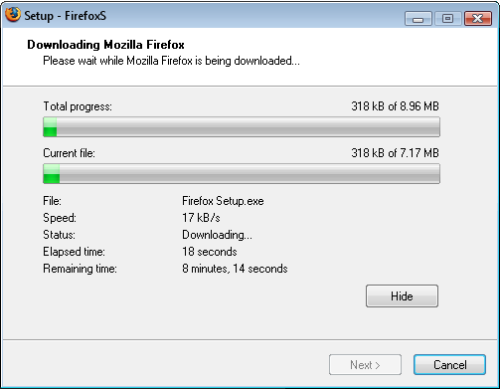 Since it offers a very easy way to install Mozilla Firefox even inexperienced computer users and users with a restricted user account (so you know itOCOll work for everyone), who otherwise wouldnOCOt get past the - for them difficult - questions the normal installer asks, can use Mozilla Firefox. Also it doesnOCOt only install Mozilla Firefox, but can also immediately open websites in it (like the website in Internet Explorer from which it was started). So Utilu Silent Setup for Mozilla Firefox allows web developers to require Mozilla Firefox. Any other web browser, like Google Chrome or Opera, is fine too, but note that Apple Safari canOCOt always be installed, because it requires Administrative privileges. By including Utilu Silent Setup for Mozilla Firefox on their website web developers no longer have to waste hours and hours on problems which occur only in non-standard compliant browsers. For every website they can decide if they target all versions of Internet Explorer, or only older ones (for example only Internet Explorer version 1.0 through 7.0). This is just how Adobe Flash Player gets installed anywhere: Flash just says OCtclick here to view thisOCL, which results in Flash being installed. This works great, because Flash is not installed by default while the installed base of Flash is over 99% percent.